Rodamientos IRB Bilbao S.L. hereby notifies and informs its website users of its Policy on Personal Data Protection (hereinafter PPDP), pursuant to the provisions of Spain’s Law 15/1999 of 13 December on the Protection of Personal Data (hereinafter referred to by its Spanish initialism LOPD), whereby they may decide in a free and voluntary manner whether they wish to provide the personal data that are asked to post on the company’s website. Rodamientos IRB Bilbao S.L. reserves the right to amend its PPDP according to its own criteria, as well as in response to any changes in the law, jurisprudence or business practices. In the event of any amendment being made, the new text will be posted in this same link, where the user may access the current PPDP. Nevertheless, the relationship with users shall be governed by the rules in force at the precise moment the link is accessed. Rodamientos IRB Bilbao S.L., a company incorporated in Spain, is the holder of the database generated with the personal data provided by the users of the different forms on the company’s website, and complies with the duty of registering those files of a personal nature with the Agencia Española de Protección de Datos [Spain’s Data Protection Agency], as well as with all other requirements made in observance of current legislation. The purpose of these files is to provide more detailed and personalised information on the company, its products and its advertising campaigns, manage the purchasing and services process, and respond to any query or request for information made. No data shall be disclosed to third parties, without understanding disclosure to mean the processing that associate companies provide to Rodamientos IRB Bilbao S.L., pursuant to the provisions of Art. 12 of the LOPD. Users agree to allow the personal data they have provided to be processed by Rodamientos IRB Bilbao S.L., being responsible for ensuring such data is accurate and complete. Users are hereby informed that the data provided shall be included and processed in a file called CLIENTES [CUSTOMERS], with Rodamientos IRB Bilbao S.L. being responsible for said file. The party responsible for the file undertakes to uphold the duty of confidentiality laid down in current legislation as regards the personal data contained in electronic files. 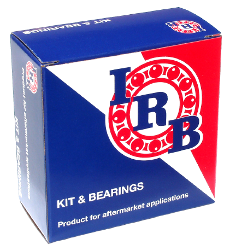 In addition, users are informed of their right at any time to access, correct, cancel or, as appropriate, contest their data pursuant to the provisions of the LOPD and to any other applicable legislation, either via e-mail at irb@irb-bearings.com or by writing to Rodamientos IRB Bilbao S.L., at the following address: Calle Dr. Díaz Emparanza 3, 48002 Bilbao (Spain). If users have any suggestions or questions regarding the security of e-commerce systems and/or the PPDP, they are kindly requested to send an e-mail to the above address, specifying in the Subject line “Suggestion/Question”. When the reason for contacting Rodamientos IRB Bilbao S.L. involves a claim or complaint regarding a breach of users’ privacy or of the security of their e-commerce systems, they are kindly requested to send an e-mail to the above address, specifying in the Subject line “Complaint”. Rodamientos IRB Bilbao S.L. undertakes to respond to their claim or complaint within a period of 15 days, replying through the channel the user has specified. If they are not satisfied with the proposed solution, the aforementioned Agencia Española de Protección de Datos and, as appropriate, the Courts and Tribunals Bilbao shall be empowered to resolve any dispute.